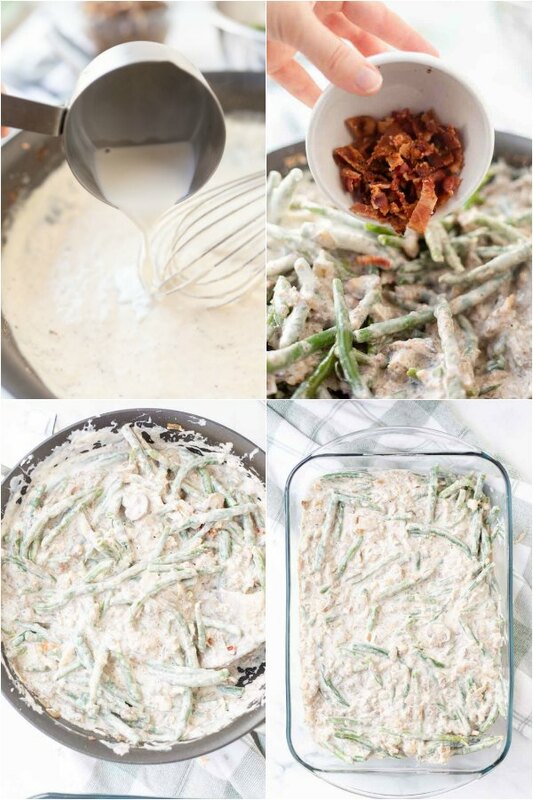 Green bean casserole is one of the most requested side dishes at family gatherings, Easter, Thanksgiving and Christmas! But this dish not only is a holiday dinner table staple, but is a regular for normal days too. It smells wonderful coming out of the oven, and the fried onion on top give an added crunch. 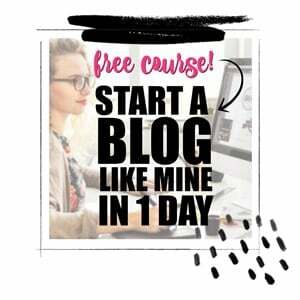 Not only is it oh-so-delicious, it’s easy to make too! Serve it alongside these easy scalloped potatoes or with this yummy meatloaf. 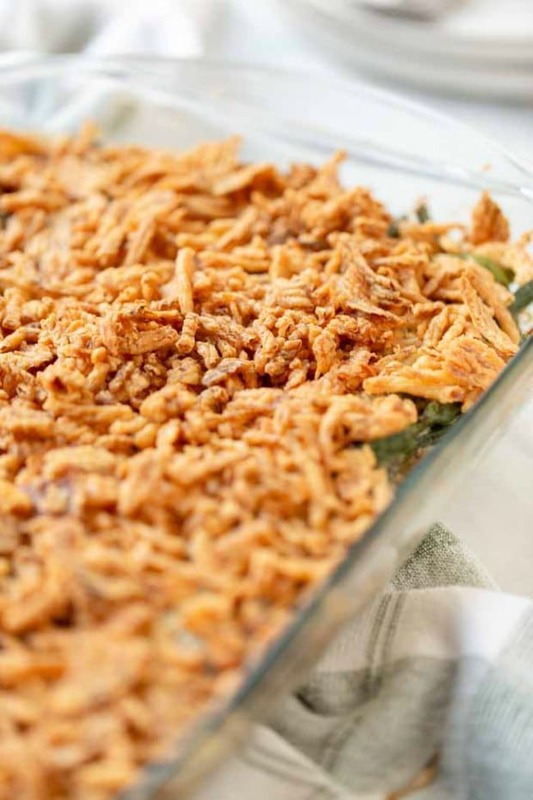 The green bean casserole was actually invented thanks to Campbell Soup Company. They wanted to make a simple recipe with green beans and their canned Cream of Mushroom soup, something everyone had in their kitchen. 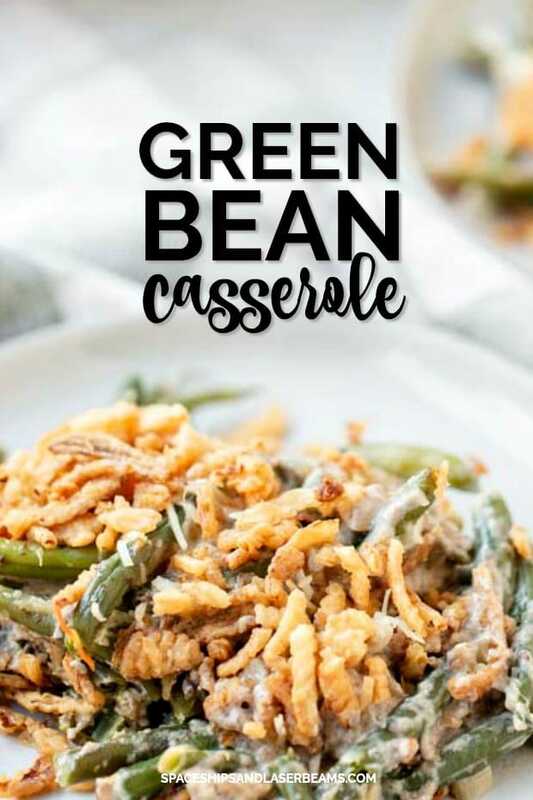 Campbell’s green bean casserole recipe helped this dish become the traditional holiday staple it is now. 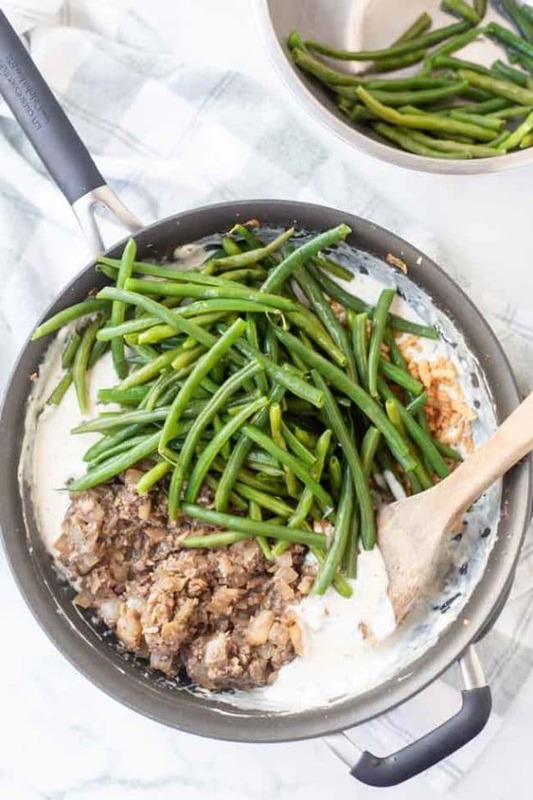 Today, many variations to the green bean casseroles recipe have been created, but the original remains just as popular, with their canned cream of mushroom soup and French’s French fried onions. In my green bean casserole recipe, I’ll be using frozen green beans. You can always swap them out for fresh green beans as well. Some of the cheese will be also used as garnish, along with french fried onions. First, crisp up the bacon in a skillet over medium high heat and set aside. Chop it up when it is cooled. Wipe up the grease from your skillet, but leave about 1 tablespoon in the pan to fry the mushrooms. Cook the mushroom, onion, and garlic and set it aside. Steam your green beans until it is the tenderness you’d like. Then, melt some butter in the skillet, and add in flour and whisk once the butter is completely melted. The mixture will start to thicken in about 30 to 60 seconds. When it does, slowly add in half & half in increments until it gets much thicker. Add salt, pepper, Italian seasoning, and a cup of parmesan cheese. Stir until the cheese melts. Add in the green beans, mix of chopped bacon, onions, and mushroom, as well as ½ a cup of fried onion. Move your mixture into a casserole dish. Top with the rest of the parmesan cheese. Now the dish is prepped for the oven! The last step of the casserole is what ties everything together. It’s what makes a casserole…well, a casserole! Bake the dish in the oven for 20 minutes. After it’s been baked, take it out of the oven and top with more fried onions until it is completely covered. Bake again for 10 more minutes, or until it’s bubbling. 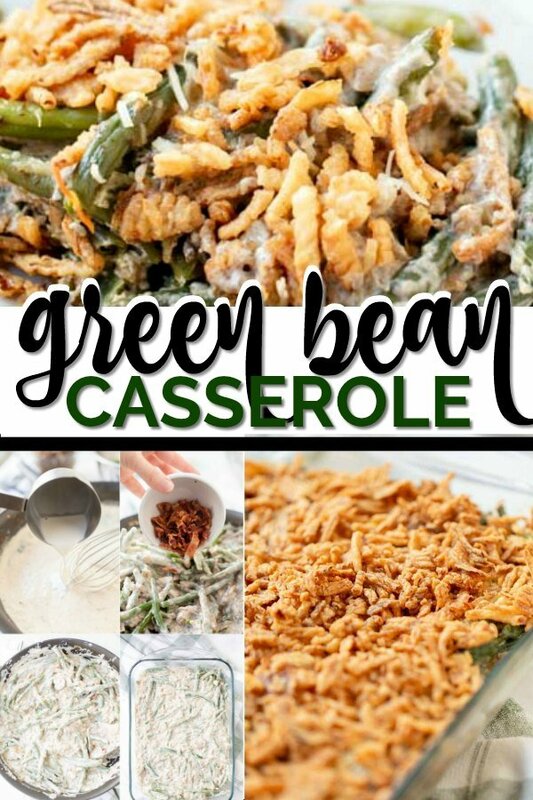 Enjoy your perfect string bean casserole! Swapping out ingredients makes things much easier. For one, I prefer buying the ready-to-steam packages of green beans from the frozen food section. That way, I can just grab it and cook it in one go without having to switch between cooking vessels. It definitely makes my life easier but doesn’t make the casserole taste any less tasty! Skip the sauce cooking by replacing with canned cream of mushrooms, just like the original recipe. It’s already seasoned so all you have to do is cook your vegetables and assemble your string bean casserole. This simple hack will definitely lessen your prep time when you’re in a rush. I get just as many compliments when I take this shortcut. Another way to make it easier for yourself is to change the cooking method completely! 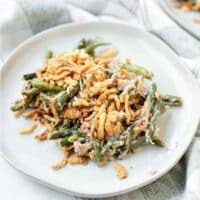 Crockpot green bean casserole is another way you prep ahead and not have to rush during dinner time. Simply assemble and cook on low for 5 to 6 hours. Top with the rest of the fried onions once it’s done cooking. With so many different secrets, there’s simply no excuse when the family absolutely needs their casserole fix. 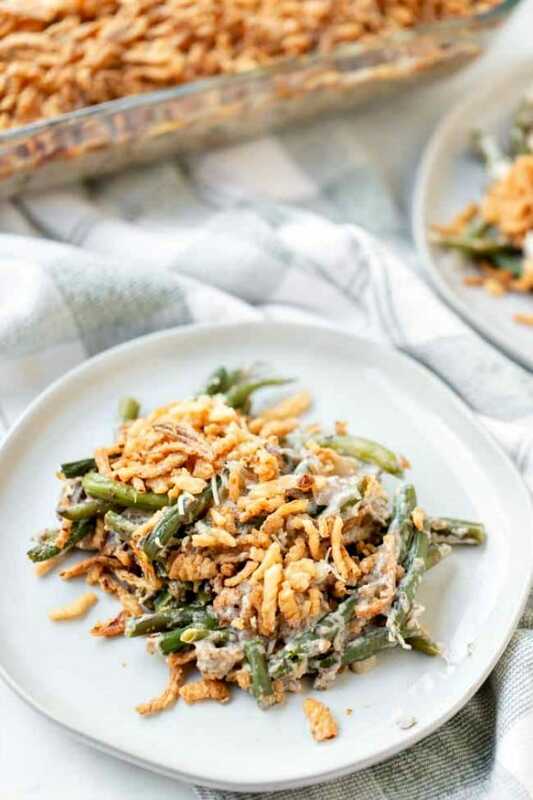 This green bean casserole is a simple recipe made with frozen green beans and topped with french fried onions. In a skillet over medium high heat, cook bacon until crispy. Set aside and chop when cooled. Wipe some of the grease from skillet, but leave about 1 Tbs in the pan to fry your mushroom mixture. Cook mushrooms, onion, and garlic and set aside. Steam frozen green beans until you have reached your desired tenderness. Melt butter in skillet. Once butter is completely melted, add in your flour and whisk together. Once it starts to thicken (about 30-60 seconds), slowly add in half & half in increments until mixture is thickened. Add in salt and pepper, italian seasoning, and 1 cup of parmesan cheese. Stir together until the cheese is melted. Add in chopped bacon, onion and mushroom mixture, and ½ cup of fried onions. Top with ½ cup parmesan cheese and bake in oven for 20 minutes. After 20 minutes, take your casserole out of the oven and top with 2 cups (or more!) fried onions until completely covered. Put dish back into oven for 10 more minutes, or until casserole is bubbling. This is my go to green bean recipe! Always a favorite in our home.